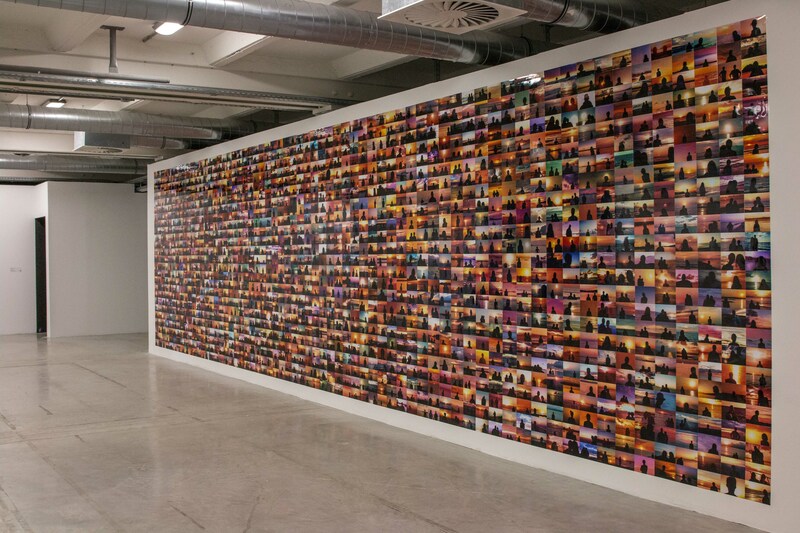 This article starts with looking at Jesse Alexander’s thought-provoking images of Erik Kessel’s work ’24 Hours of Photographs’ where Kessels downloaded and printed every photograph uploaded to FlickR during one 24 hour period. The ‘flood’ referred to in the title of the article therefore referring to the ceaseless publication of new images on the Internet. I think the artwork could be interpreted as being somewhat derogatory. He presents the photographs as if they have been thrown away in a pile, or are wasting the entire space of a room and not just the floor, by physically ‘filling up’ the room. He avoids the real function of FlickR itself i.e. to be used in a similar way to Facebook and the other so-called ‘social networking’ websites and one of the purposes of the site is to bring together like-minded people interested for example, in a particular genre of photography, or around a particular location. Other purposes of the website include providing inspiration, or educating people in photography. It was never designed to be consumed in its totality, rather, for people to customize and extract the elements which are of interest to them. I do admit however that the artwork was thought-provoking. It made me think of the time and energy expended by all those individuals creating the images. What other perhaps more useful purpose could their time have been spent on? What if everyone, instead of uploading to FlickR on a particular day all donated that time spent to something more useful, more charitable perhaps? The image reminded me very much of a photograph I had seen on a visit to Marseille’s La Friche de la Belle de Mai, a former tobacco factory converted to a cultural centre for all forms of art including Photography. The image was taken by Penelope Umbrico and was a mosaic of a large number of sunset photographs selected from FlickR on 4 May 2015. She had over 27 million sunset images to choose from (27,7000,711 to be precise!). I think that the same intention was there, to shock the viewer into understanding the sheer volume of photography activity happening in the world, but instead of depicting them as ‘rubbish’ she effectively creates a credible artwork signifying that each individual photograph potentially has its uses, plays its part and has a role not only to the individual taking the image and retaining that memory via a photograph, but also sometimes in a wider context, to create art! This suggests that there is a new genre or ‘layer’ of photography emerging to counterbalance the ‘flood’ which in itself is creative rather than being the ‘end of photography’ as a serious art form as we know it. I personally like the ‘flood’. It gives me inspiration via sites like FlickR, it means that photography is no longer just for Photography Club anorak-wearing nerds that bang on about their elite equipment, it is reaching far and wide and becoming something we all accept virtually internationally as an ingrained part of our culture, and crucially, we appear to enjoy! ‘If you look at many photographs – that’s true not only for snapshots – it’s nearly impossible not to notice recurring patterns’ I assume this is generally how photography developed anyway: rules of composition didn’t happen by accident, they developed by looking at images that somehow appeared to ‘work’ whilst others looked ‘unbalanced’ or unpleasing to the eye somehow. The ‘recurring patterns’ while the art form was evolving would have included keeping horizontal and vertical lines parallel to the edge of the frame, picking 3 items to include in a group rather than 4, say, using leading lines etc. Colour theory would also have been developed by the physical human reaction to seeing contrasting colours together. Both types of emerging ‘patterns’ would have led to photographers taking images which generally comply with rules of composition and colour. Now that photography is much more advanced it should be no surprise to us that given the volume produced, that focus on patterns within photography has evolved to looking at e.g. how wedding group images are formed which best ‘fit’ the needs of the married couple to remember their guests, the way they interacted on the day etc., and why these formats are copied in their 1000’s. Schmid has developed this into more of a scientific study of the patterns and how they seem to educate us ‘subliminally’ to take photographs that conform to ‘norms’. ‘A digital presentation seemed to be the obvious way to present digital images. I was happy with the results but I noticed soon that it is difficult to get an attention span of more than a few minutes for digital presentations. Then I tried books. People look at them much longer, page by page, going from book to book. I have seen people who spent two hours looking at books’. This should be obvious to anyone who uses the Internet regularly. The entry point is via a search engine which presents slithers of information together to allow you to locate the article containing the information you need. The skill of scanning snippets of information at high speed is related to using a computer and the efficiencies you gain from that. Why would you then assume to use the same piece of equipment to fully digest information (be that an image or an article)? Very frequently I print stuff off from the Internet in preference to reading it on screen, not just because it saves my eyesight from the glare of a screen, but simply so I make a point of reading it through thoroughly from start to finish. It is the same with images. Also there is a sensory, tactile pleasure gained from holding a book or print, feeling the texture and even sometimes smelling the pages/prints (especially old musty ones!). ‘If millions of people are happy taking the same pictures again and again they won’t stop.’ Sontag highlighted the ‘work ethic’ drive to capture and record all of our images and she even went on to suggest that this is very apparent for certain nationalities who are traditionally predisposed to having a strong work ethic such as the Chinese and Germans when they are on holiday. (Sontag, 1977). Further, people are not generally interested in the millions of other photographs out there that match their ‘set’, they are just interested in their own and therefore it’s actually totally irrelevant that the global stock of photographs contains so much repetition or clichéd patterns. ‘I think we have to face some facts hardly anyone talks about. One of them is overproduction, not the overproduction of photographs but the overproduction of photographers. There are hundreds of art schools in Europe, each of them churns out another bunch of young artists every year, and most of them don’t stand a chance on the art market. A limited number of galleries, a limited number of collections, shrinking budgets of public collections, and a constantly increasing number of artists.’ This is something which probably the OCA welcomes with open arms, but from a student perspective, I think Schmid is worrying too much! Students of photography will have multiple reasons for studying it in 2015: they may want to just generally improve technically for their own personal (hobby) satisfaction; they may want it to support another venture such as that of teaching, where this skill might be used to provide additional learning materials or charity workers who may wish to advertise their own events, create their own websites etc. Maybe many just simply enjoy it ! Years ago, the majority of students of photography probably set their sights on higher achievements, but generally had fewer reasons to study it – perhaps they wanted to go into journalism or take portraits of celebrities or the royal family, the common denominator was that this was likely to be their main source of income; nowadays the link between the study and the target end result might be a vast range of reasons not solely linked to generating income. Sontag, S. 1977 On Photography. Penguin Modern Classics, 2014. The context of a photograph and its surroundings (i.e. what’s outside the frame as opposed to what’s inside the frame) are fundamental to how it comes to exist and how it is consumed. No photograph exists without a purpose, background or context. Context is not only the geographical placement of the photograph (Twitter, billboards, gallery), although that is very important. Context also means the ideological positioning of the photograph or series of photographs. a representation of a particular situation or process in such a way as to reflect or conform to an overarching set of aims or values. Individual photographs and series of photographs hold within them their own narratives (i.e. what’s within the frame). This course will refer to narratives both within single pictures and series of photographs. By ‘narrative’ we mean the visual flow, the coherence of the set of images, or the construction of the single image. Boothroyd, S (2014) Context and Narrative. Barnsley: Open College of the Arts. Following a rather mad clamber to get my ‘The Art of Photography’ (TAOP) coursework (online and offline blog) compiled and ready to be shipped to assessors by the end of September, my intention was always to enjoy a relaxing couple of week’s time off from OCA work at the beginning of October. A few days of thumb twiddling later however, it didn’t take long for me to start chomping at the bit to begin my next course again so delivery of ‘Context and Narrative’ made it through my letterbox in the second week of October. I’ve now spoken to my tutor on the telephone (who sounds great! ), read the ‘Introduction’ section of the course materials, set up this new on-line blog, and planned some provisional assignment submission dates. I’m determined that after the rather pressurised end to TAOP, this course will be all about good study planning, allowing plenty of time for reading and research, and gradually building up my blog so it appears completed as if by magic in 12 months’ time. I shall look forward to reviewing this early reflection (hopefully without snorting in a ‘yeah right, that was bound to happen !! !’ kind of way too much). Critical reading checklist :- When reading texts you should take into account details of the source in order to take a suitable level of influence from it, in particular the publisher, the author, the context (‘When was the text written and for what audience?’), the main argument, how well the argument has been constructed; and are the conclusions justified. (I have kept a separate copy of this list handy to refer to when looking at different sources). I also looked at Bridgeman Education and Oxford Art Online libraries. The Bridgeman site was extremely frustrating in terms of speed and it didn’t seem to bring back many articles or photographs even when adding fairly popular photographer names into the search engine. Oxford Art on the other hand looks to be a resource I will use frequently, especially to look for summary biographies for photographers; it seemed very comprehensive (and much quicker!). One of the best pieces of advice I have gleaned from this introductory material is the video review by a tutor of a photography student’s notebook learning log. 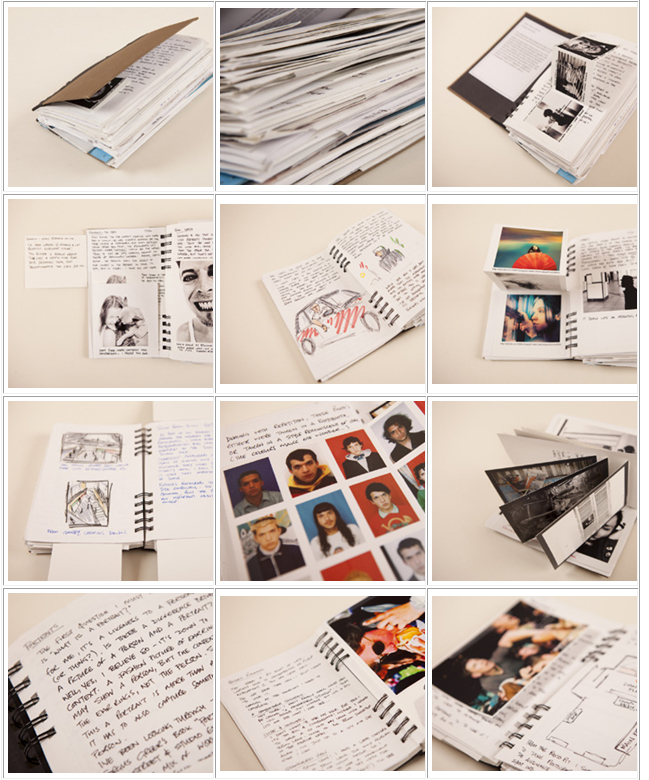 The student was Rob Brisco and some images of his notebook are shown above. The tutor loved the ‘physicality’ of his notebook – the attached excepts, postcards, pull-outs, which gave him a real pleasure in reading and handling the log. He also highlighted that the blog contained a number of short reactions to images spotted or ideas thought up by the student, which indicated to him that this was a notebook that was carried everywhere and effectively contained all his thoughts through the course. I also was really impressed by the layout and as such plan to start my own in addition to this on-line blog.